Have you ever wondered if the fish you are casting to can see you? A good friend of mine Wendell Ozefovich produced a video some years back that will answer that question for you. Whether your target is a trout in a mountain stream or big bluegill or largemouth bass patrolling the shoreline of a farm pond, it is essential not to let the fish see you. Have you ever tried to sight fish to a good sized bass or panfish only to have that fish slowly slide out of view just as you began to make your cast? If so your not alone. The most likely explanation is that the fish became aware of your presence and decided to get out of Dodge. Wendell, known as Ozzy by his friends, has produced some high-quality videos that focus on the underwater world of trout and other fish. I had the pleasure of working with Ozzy on a number of his videos, and I was always amazed at the quality of the finished product. 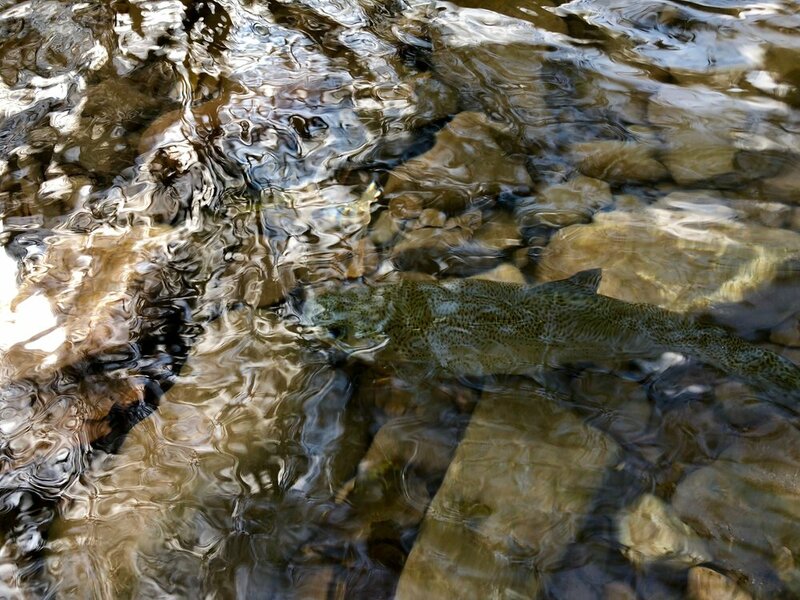 While the video I mention here focuses on trout, everything in the video applies to many predatory fish, including warm water species. This video will explain how a fish’s vision works and that knowledge will make you a better fisherman! Ozzy’s video The Underwater World of Trout, Trout Vision and Refraction gives the angler a look at the underwater world of the trout and explains how the trout (substitute any fish you’d like) views our’s. What you will learn during this 75-minute video will make you a better fisherman by giving you an understanding of what is going on under the water and how the fish you are pursuing are observing you and the flies you present to them. Ozzy’s videos are nothing new to the fly fishing world. They have been around for many years. So why mention them now? Well for starters, the angling world has the opportunity to view them online for free! Previously the only way to see one of Wendell’s videos was to catch one of his presentations at fly fishing shows and fishing club meetings or purchase them for yourself. You can still buy Ozzy’s videos from his website www.underwateroz.com. His three video series (Discovery, Feeding Lies, and Trout Vision and Refraction) are available individually or as a complete set. The exciting news is that some of his videos are now available on YouTube in their entirety. Ozzy has entered into an agreement with The New Fly Fisher, and the videos are available for viewing on their channel. Discovery and Trout Vision and Refraction are currently up on The New Fly Fisher’s YouTube channel, and I encourage you to check them out. I don’t know how long they will remain up so head over to The New Fly Fisher and take a look for yourself. You will not be disappointed.